thanks to Elijah for the photo! and the memory! It’s easy to acknowledge the singularity of each life in a theoretical way, but much harder for me to absorb this reality in a way that impacts how I live. It’s easy to say, almost flippantly, you only live once. It’s much harder for me to let this truth instruct me and guide the actions I take. So, I am working to break carpe diem down in to individual days, each one unique, a one-time-only opportunity, and to let this perspective help inform my living, my decisions, the expansion of my heart. It’s the last day of my week in the mountains with my family tribe. More of what was once future has slid into the past, sands of time falling in their one irreversible way. There is a wisdom about how to appreciate the three tenses of time–past, present and future–in our lives. We can anticipate an event before it happens, experience the moment fully as it is in the present tense, and then finally, pause to savor it as a memory. Each time stage has its own richness. Each rounds out our lives. They all contribute to the fullness of our days. I am looking forward to this last day of tribal vacation. I know that on the trip home, my husband and I will review highlights, a ritual we enjoy after special days or events. It is part of our stepping into that step of savoring. Sharing, we enrich both our individual experiences, our gratitude for the people in our lives and the memories we’ve made with them. It’s a mini-version of the whole life course. What things are you looking forward to? What moments are you living that you will soon be savoring? What are some of your favorite memories? One day at a time, we create these lives we live. 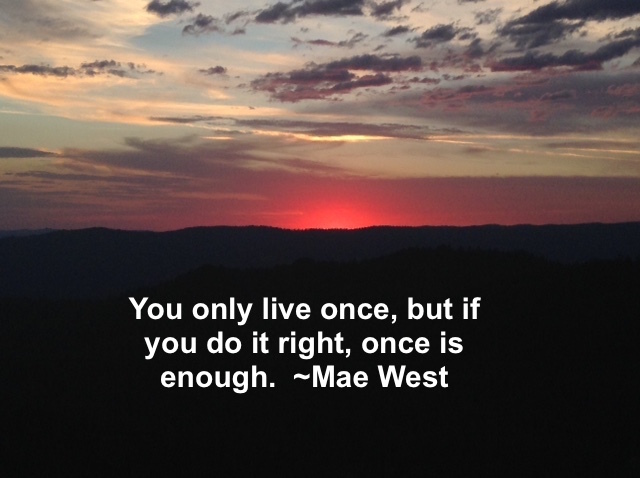 This entry was posted in Finding Enough, Leaning In, Mindfulness, Touchstones and tagged anticipation, carpe diem, Dr. Seuss, highlights, Mae West, savor, three time stages. Bookmark the permalink. Lisa right now I am savoring the memory of my first granddaughter arriving and following that the marriage of my youngest and in-between those two savoring the memories of a friend and loved one dying far too young. Wow, Kate, those are powerful experiences you’re recalling and giving additional life to by attending. I appreciate how you are weaving joyful and sad events together, recognizing life as both. Thank you adding to this post.